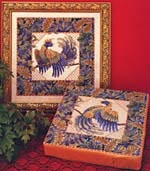 Model stitched on: 28 count Vintage linen from Wichelt Imports, Inc.
Model size: 11.5" x 11.5"
Description: A pair of fanciful, stylized birds, each within a luxuriant foliage border. Deep, rich colors: blues, greens, and golds, and a square format make these dramatic designs suitable for either framing or pillow tops. Background Information: This pair was created in response to requests for home-decor designs. I chose bold, deep colors, and time-tested favorites: birds and foliage and a square format for maximum versatility in end-usage. I also designed them using all whole cross stitches, so the designs would translate to wool and canvas. Stitching Comments: I would rate these designs as fairly easy to stitch: they are not large, and are all whole stitches, with no backstitching. Although there are blended floss colors (about one third), the charts are computer generated and very clear, making these designs suitable for a relatively inexperienced stitcher.